A slew of young celebrities, including Lindsay Lohan and Samantha Ronson, reportedly swam in a pool that had not been drained after a dead body was found in it. The body of 30-year-old Jordan Nagler was found at the bottom of Roosevelt Hotel's Tropicana Bar pool by hotel staff on October 13th. Apparently, the pool was never drained after the body was removed! A source claims that hotel management felt “there was enough chlorine in it to kill the bacteria” and that the staff was told not to "say anything to anyone". 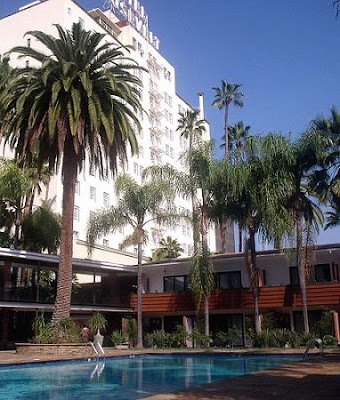 The Roosevelt Hotel, located in the heart of Hollywood, has been the hangout for young trendy celebrities from the late Marilyn Monroe to Lil' Kim. This can't be good press for Good Ol' Rosie.